On the morning of Friday 11th November 1977 both Radio Caroline and Radio Mi Amigo's programmes were continually being interrupted by generator problems and, at 12 noon, the two stations closed down. Over the following weekend severe storms hit the North Sea with gales of up to force 10. Both outlets remained silent. Although coastguards reported that they had received no emergency calls from the Mi Amigo, press speculation began about the possible end of Radio Caroline. 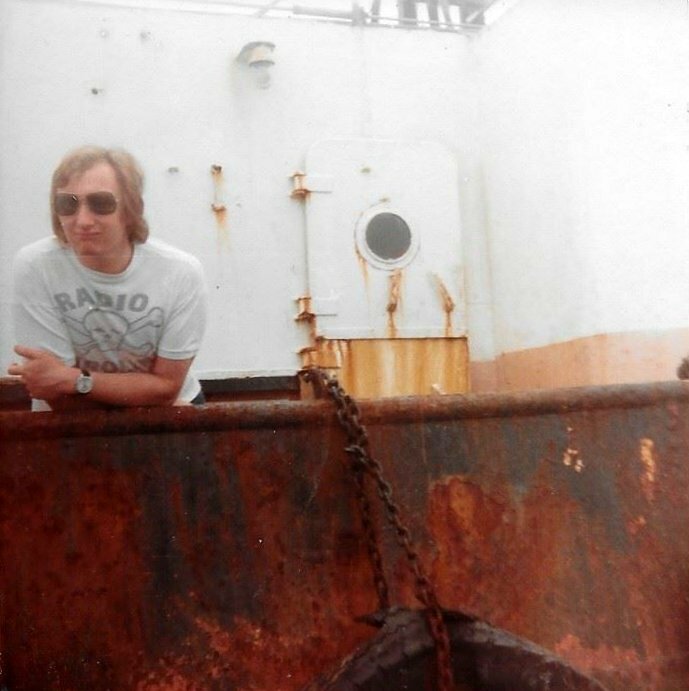 DJ Stevie Gordon on the deck of the mv Mi Amigo, a photo posted on Facebook by the man himself. Following stories about the station's lack of money and with some new wild and untrue rumours about the ship's mast collapsing, some wrote the station off. In fact the mast was perfectly alright and the Mi Amigo was still riding at her usual anchorage. However, because of bad weather, no tender had been able to visit the ship and the DJs had stopped broadcasting to conserve enough fuel to run the ship's lighting and to cook an occasional hot meal. The food supply got so low that the team on board were down to a small sack of potatoes, a packet of rice and one of spaghetti. For a week the DJs and crew had lived on dry soup. Fortunately the weather improved and a tender arrived bringing much needed supplies. The station returned to the air on Tuesday 22nd November. The technical faults persisted but at least everyone was safe and, to say the least, the reports of Caroline's demise were premature. Work continued on the generators and soon service was back to normal. One unexpected development was the announcement that, as of 1st December 1977, Radio Caroline would revert to night-time broadcasting only. It had become apparent that by Radio Mi Amigo having the exclusive use of the big transmitter and Caroline only able to use the 10 kilowatt one, audiences for the English programmes had fallen. 962 kHz (“319”) was the clearer of the two frequencies so Radio Mi Amigo was moving across and the two stations were going to share it. After a year and a half of an all day service, Caroline was going to be nocturnal again. Brian Martin starts his lunchtime show on 30th November 1977 and plays another version of the promotion which includes the announcement in French. Clip edited from a longer recording shared on the Internet Radiocafé, now known as the Radiotrefpunt (radio meeting point) forum by Vincent. Our thanks to him (duration 3 minutes 21 seconds). At 11am on 1st December Radio Mi Amigo opened up on 962 and Caroline's 24 hour service was no more. “Europe's first and only album station” was now on the air between 6.30pm (later 6.00pm) and 5am GMT each night. 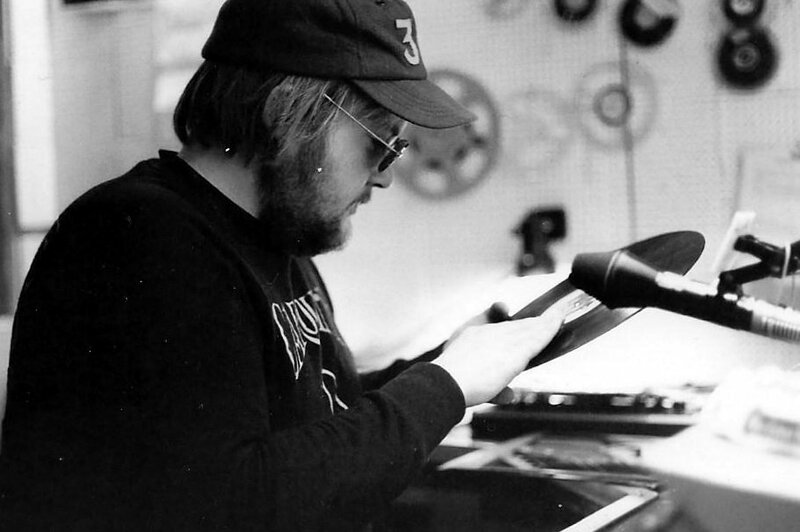 In February 1978 Caroline began running an album chart show. Although the programme was weekly, the chart actually changed every other week. Called The Caroline Countdown of Album Sound, it was broadcast on Monday evenings. See here and following pages. Mike Stevens and Mark Lawrence celebrate Caroline's 14th birthday with a Top 50 chart countdown on 26th March 1978. Recording from the Golden Radio NL archive shared on the Internet Radiocafé, now known as the Radiotrefpunt (radio meeting point) forum by MartinJA. Our thanks to him (duration 3 minutes 51 seconds). Two of Caroline's best-loved DJs joined the station that summer: Tom Hardy presented his first show on 5th June and Richard Thompson (now known as Bob Lawrence and still with the station) came aboard in August. 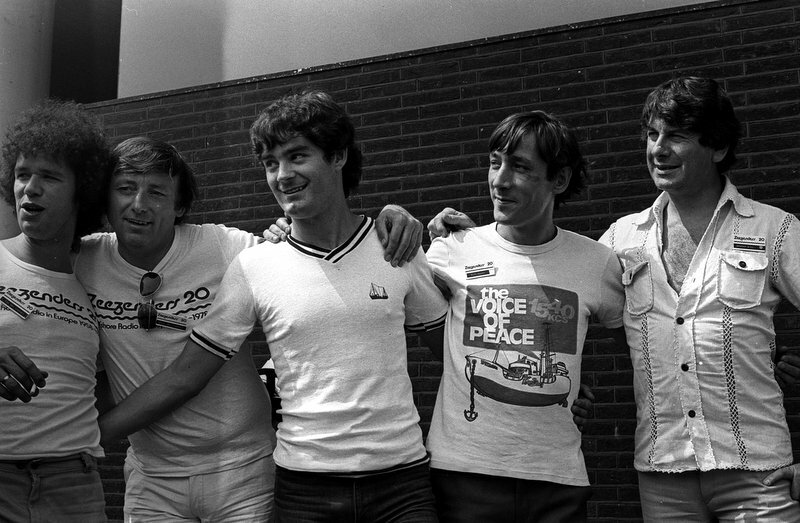 Left to right: Organiser Ton van Draanen, DJs Paul Hollingdale, Stuart Russell, Tony Allan and Graham Gill at ‘Zeezenders 20’. Photo by Rob Olthof. More of his photos from the event are here. An article written by the DJs aboard the mv Mi Amigo in August was published in the sixth edition of the Caroline Newsletter. You can see it here. 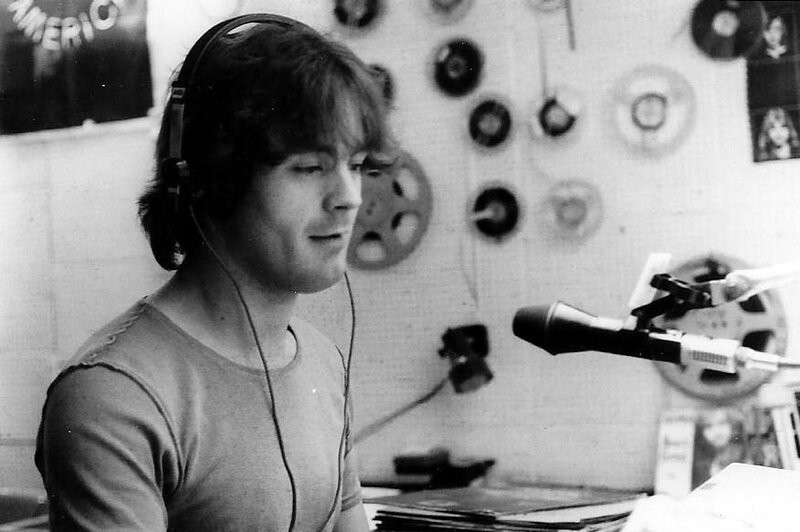 Zeezenders 20, mentioned in the article, was a Dutch free radio convention held in Noordwijkerhout in July 1978. It was organised by Music Radio Promotions (the company behind Flashback '67, held in London the previous year) along with Hans and Jelle Knot, Ton van Draanen, Marc Jacobs and Frans Schuurbiers. Radio Day, as it became known, went on to become a popular annual event in The Netherlands for many years. During September Caroline boss Ronan O'Rahilly had discussions with a company called Radio Hollandia. They were offering to replace Radio Mi Amigo with taped programmes manufactured legally in Holland for in-store closed-circuit systems in shops and restaurants. 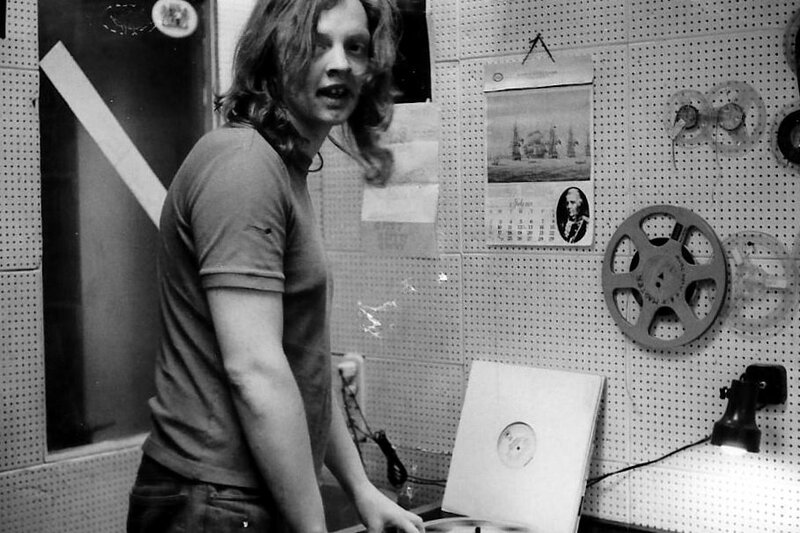 Former RNI and Veronica star DJs Joost den Draayer, Tony Berk and Will Luikinga were involved so it would have meant some big names being heard on the station but Sylvain Tack, Radio Mi Amigo's owner, insisted that he still had a contract with Caroline and that Hollandia could not take over his airtime. Towards the end of October 1978 high seas and storms attacked the Mi Amigo. At 11.54am BST on the 20th October Radio Mi Amigo closed down when smoke started billowing from the last remaining working generator. There was a brief Caroline broadcast that evening to let the the office know what was happening. Continued bad weather held up the tender so no supplies could reach the troubled boat. During this period of enforced ‘dead air’ Sylvain Tack decided he had enough of financing Caroline. It was time for Radio Mi Amigo to go it alone and buy its own ship. 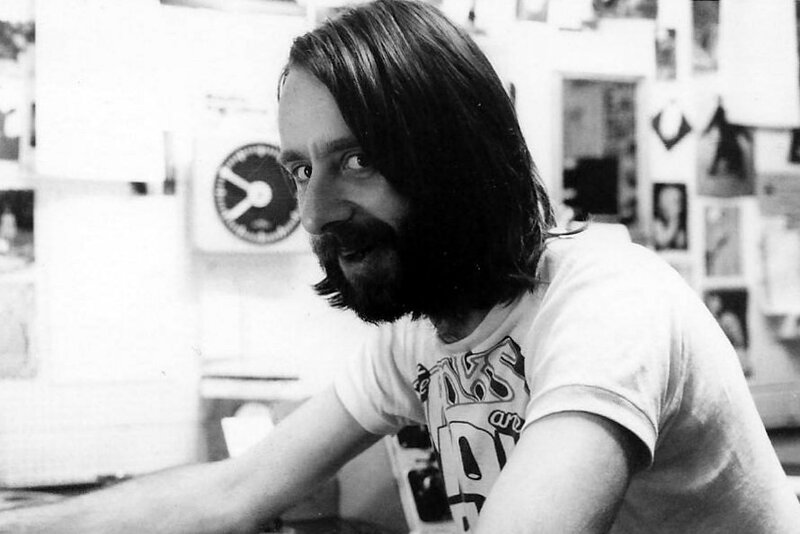 One of the English DJs on board at the time of the split with Radio Mi Amigo was Stuart Russell, now known as Nigel Harris. In his fascinating book, Ships in Troubled Waters he reveals how the end happened. Firstly a Dutch tender arrived. The tender crew spoke to the Radio Mi Amigo personnel in Dutch but no one would tell the Caroline men what was going on. The Mi Amigo team then left the radio ship on the tender, still without saying anything to their English-speaking shipmates. The tender steamed away then turned and raced full pelt towards the radio ship. As Stuart writes in his book “a collision seemed inevitable”. The Caroline guys thought their end was coming but, at the last moment, the tender's engines were slammed into reverse and it veered to starboard. Maybe common sense had prevailed. A collision would have been disastrous for both vessels. The tender crew then attempted to cut the radio ship's anchor chain but, fortunately, the movement of the two boats made this too difficult and the attempt was abandoned. When a British police vessel turned up to see what was going on, the tender turned tail and headed off to the Continent. It is not known exactly what they were up to but, as Radio Mi Amigo was about to launch a new ship, it could be assumed that they wanted to do as much damage to Caroline as possible before leaving. It wasn't just the Radio Mi Amigo DJs who had gone. As Sylvain Tack's money had paid for the ship's crew, the end of their agreement meant that the Captain and his men departed too. This left just the Caroline DJs and engineers alone aboard the storm-battered and silent radio ship. Four photos of some colleagues posted on Facebook by Stevie Gordon, reprinted here with his kind permission. Clockwise from top left: Mark Lawrence, Mike Stevens, Stuart Russell and Roger Mathews. Following the stories of Caroline's financial difficulties, the continued lack of output served to re-emphasise rumours of possible closure and, once again, the newspapers wrote their stories. This time it even ran to a Daily Telegraph leader article, commiserating on the demise and congratulating Caroline on a successful career. As Christmas 1978 came and went, 962kHz was still quiet and life aboard the mv Mi Amigo was becoming increasingly unpleasant. Fuel supplies were so low that the power was only switched on for three hours a day - just long enough to cook one meal. Without continuous power, the food in the deep-freeze began to rot. Peter Chicago came ashore in an effort to organise supplies, leaving Roger Mathews, Tony Allan, Tom Hardy and two Dutchmen, Bernard Gratz and Marcel Aykman, on board. The weather continued to deteriorate and the heavy seas caused some rivets holding a steel plate in the ship's hull to pop. The ship began to take in water. One generator had to be run non-stop just to power the pumps but the effort proved too much for it and, on 17th January 1979, it gave up the ghost. Without the pump, the water level began to rise and, with a force 7 blowing, the DJs were forced to broadcast a ‘Mayday’ distress call. A helicopter from RAF Manston investigated and confirmed the emergency. On the afternoon of 19th January the Harwich lifeboat was launched. At about 6pm she reached the listing Mi Amigo, whose stern was now almost completely under water, with the bows sticking up in the air. The crew (and Wilson the pet canary) were taken off and the ship was left to the elements. 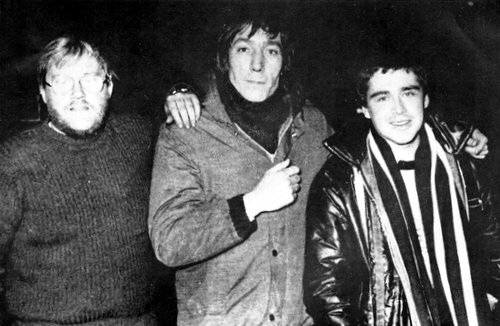 Left to right: Roger Mathews, Tony Allan and Tom Hardy after being brought ashore by lifeboat. Photo from ‘Caroline - A Story in Photos’, published by Three Master Productions. An All-Time Top 50 favourite tracks chart, as broadcast at Easter 1978, is here. An article by the DJs about life on the Mi Amigo is here. Part ten of ‘Caroline In the 70s’ is over the page.